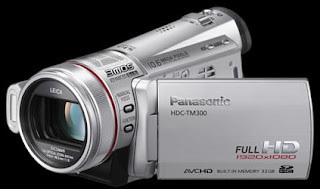 A friend bought a Panasonic HDC-TM300 HD video camcorder recently and boy, am I jeles, jeles, jeles. LOL Although I have yet to test out his new video camera, I have seen the videos he shot and that’s just the kind of video quality that I am looking for. You know, I’ve been trying to build up my video profile on YouTube but with the lousy video quality that I have been uploading, it could be quite embarrassing. Besides, seeing the awesome video quality that other members upload, I don’t even have the mood to shoot anything anymore. According to the website of Panasonic Malaysia, the retail price of this camcorder is MYR4499. It comes in silver or black. My friend says he bought his at slightly under MYR4000, excluding accessories. That’s a lot of moolah to spend on a hobby and I am too cheapo for that! 😛 So how??? 3 Responses for "I Want Panasonic HDC-TM300"
Sounds like a great piece of equipment. I have been planning to get myself a video camera long while since I took up the course that touched on filming, back in university. However the model I am going for is the Sony HDR-XR500E or HDR-SR12E. Both supposedly costs a little over RM5,000 on the local website. Need to wait at around a couple of months more before I can get either one. I finally checked out the specs for these two units. Sony, of course, is a premium brand with a price tag to match! I actually am in two minds if I should opt for a hard disk supported video camera or a memory card one. I know I would love the lengthy videos that hard disk cams offer but a friend told me that if I were to knock the camera accidentally then the hard disk may suffer bad sectors and my video files would be lost. Replacing the hard disk would be more expensive than buying memory cards too.